Author: Greenside, Mark Set In . . . Description: Tired of Provence in books, cuisine, and tablecloths? Exhausted from your armchair travels to Paris? Despairing of ever finding a place that speaks to you beyond reason? You are ripe for a journey to Brittany, where author Mark Greenside reluctantly travels, eats of the crêpes, and finds a second life. When Mark Greenside -- a native New Yorker living in California, doubting (not-as-trusting-as Thomas, downwardly mobile, political lefty, writer, and lifelong skeptic -- is dragged by his girlfriend to a tiny Celtic village in Brittany at the westernmost edge of France, in Finistère, "the end of the world," his life begins to change. In a playful, headlong style, and with enormous affection for the Bretons, Greenside tells how he makes a life for himself in a country where he doesn't speak the language or know how things are done. Against his personal inclinations and better judgments, he places his trust in the villagers he encounters -- neighbors, workers, acquaintances -- and is consistently won over and surprised as he manages and survives day-to-day trials: from opening a bank account and buying a house to removing a beehive from the chimney -- in other words, learning the cultural ropes, living with neighbors, and making new friends. 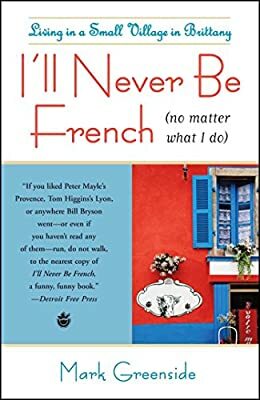 I'll Never Be French (no matter what I do) is a beginning and a homecoming for Greenside, as his father's family emigrated from France. It is a memoir about fitting in, not standing out; being part of something larger, not being separate from it; following, not leading. It explores the joys and adventures of living a double life.